career as an L.A. fashion designer. So what if her home life is falling apart. It’s her career that’s important and makes her feel alive. 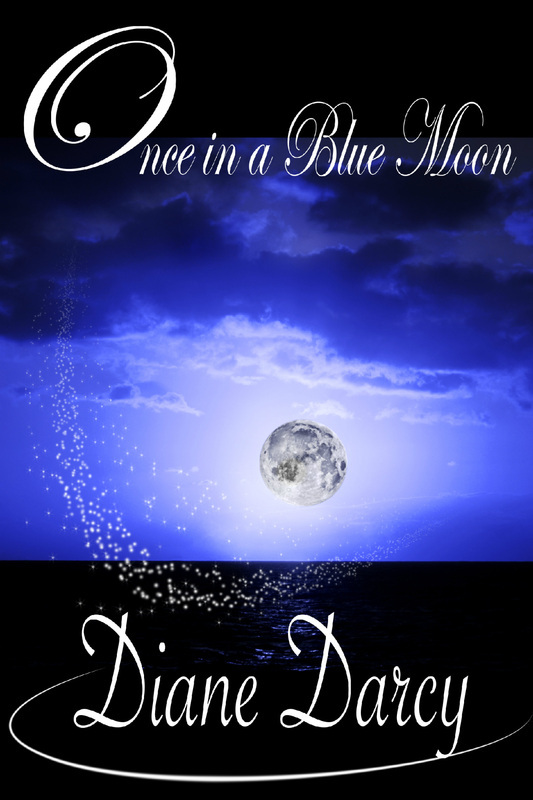 mystery, and save their family before the next blue moon? They have three months to find out. The dress was good. Too good! Anger burned in Melissa Kendal’s chest as she forced her fingers to unclench the silken material. Forced herself to relax. She held up the evening gown again, easily able to discern at a glance it was a size four, tall. Her size. As the high-quality black silk slid through her fingers she cynically wondered if Kari had sized it that way on purpose. At the same time, she reluctantly acknowledged the silk charmeuse was an excellent choice of material for the cut of the dress. When had Kari gotten so good? Melissa could feel the young girl waiting anxiously, fidgeting, the delay obviously driving her mad--as it was meant to do. Melissa let her wait a while longer, then sighed and tossed the dress on the oversized worktable. Kari stepped forward, her hands clutched together. "So, what do you think?" Melissa breathed in slowly and forced herself to calm, to look normal, relaxed. She didn’t answer right away, didn’t trust her voice. Adopting a pensive expression, she turned her attention to the television in the corner of the office and pretended to listen to the news for a moment. The television was always on, and that particular habit had paid off more than once. It gave her a chance to think. Besides, it was always a good idea to stay tuned to world events, to know what was going on in case it affected the fashion industry. She needed to be in control. On top. The best. Melissa glanced at the dress again. She was the best. She’d worked hard to be. At thirty-five she was young, had a great figure, and a career that was skyrocketing. And no barely-out-of-college assistant was going to intimidate her with good work. Picking up the dress, she flipped it over the back of a nearby chair. "No. It won’t do." Her voice came out cool, controlled, with no hint of emotion. Precisely the way she liked it. Kari remained silent for a moment, then stepped forward. "But, why?" Her voice cracked on the last word. Melissa met her gaze and stared her down. Because the creation was a little too good and she didn’t need competition from her own staff. "We’re moving away from slinky. The trend in formal wear is cotton and linen, so I can’t use this. You really need to keep up with the industry, Kari. Now, why isn’t my office cleaned? What if an important client stopped by? Let’s get back to work." Tears in her eyes, Kari picked up the dress, her long blonde hair falling forward to hide her expression as she stumbled toward the door on imitation designer heels. Melissa pushed back a twinge of sympathy and sighed in exasperation. When was Kari going to learn to play the game better? Did she really think Melissa would ever give her a break? What Kari was getting was an education in the fine art of staying on top. A hard lesson Melissa had learned, one everyone in the business had to learn if they were to succeed. Melissa was doing Kari a favor by teaching her how to become a player. If Kari had any brains, someday she’d appreciate it. Melissa plucked a thumb drive from off her desk. "Take this to Xavier. It contains a new design for the winter line. And try and pull yourself together before you come back." Kari stopped, and came back for the thumb drive. When her trembling fingers closed over it, Melissa didn’t let go and Kari was forced to meet her gaze. "Kari, make sure nothing happens to this." Resentment and understanding filled Kari’s eyes. "I wouldn’t do that to you," she said meaningfully. Melissa smiled. Meaning, of course, that while Kari wouldn’t stab Melissa in the back, the reverse wasn’t true. "See that you don’t. Leave the dress. If it’s that important to you I’ll think about it some more." Melissa saw the distrust in Kari’s expression before she lowered her gaze, set the dress down, and slipped from the room. The dress would, of course, disappear. Melissa gazed around her office, feeling intense satisfaction. She was at the top. Literally. Penthouse office, exclusive furnishings, and an enviable view. A fashionable desk and chairs, computer, assorted plants and worktable graced one corner. Several dress mannequins stood in a half-circle around a walnut cabinet holding an assortment of scissors, bolts of material and sewing paraphernalia. And, of course, her treasured sewing machines. It might be a working environment, but it was all very elegant, client friendly and expensive. Just like her. Melissa was one of the few designers not in the general work area. She’d served her time, not only in this design house, but in three others, two of them in Europe. She walked over to the huge glass windows. Twenty floors up, she had a wonderful view that overlooked some of L.A.’s best real estate. Yes, she was at the top of her game, and she planned to stay. She picked up the phone. "Stacy? Please hold my calls. You know the ones I mean." "Of course. I’ll tell your family you’re still busy when they call again." Melissa heard the disapproval in the secretary’s voice, and refusing to feel guilty, simply placed the phone back in the cradle. She inserted a new thumb drive into the computer. Time to get started again. She had hours of work ahead of her and needed to come up with several ideas for an important client. She wouldn’t go home until it was finished. Having a strong work ethic got you ahead in this game. She wasn’t going to be displaced by anyone, especially not by Kari. She dug in. Moments later, there was a knock on the door. Annoyed, Melissa considered not answering, then sighed. "Come in." Bernie Sparks poked his head around the corner, bright orange hair sticking out in all directions. "Is it safe? Or are you going to make me cry, too?" Melissa smiled, genuinely glad to see Bernie. "I think you’re safe. Nothing could make you cry. Come in." As he stepped into the room, he placed a cowboy hat on his head and she got a good look at what he was wearing. A tasteless western outfit and his traditional huge grin. He walked across the room, and twirled his lean frame around on one boot heel. "So, what do you think?" Melissa groaned in genuine distress. She raised a hand into the air as if to ward him off. "No. Stop. Don’t go there." Laughing, Bernie turned again, this time walking slowly in a circle so she could get the full effect. He wore a tailored cashmere shirt with banded collar and pearl buttons, broche silk vest, and a string tie with an alamar knot. The black hat sat jauntily on his head, a belt with a huge silver buckle circled his waist, and the faux snake-skin boots made her shudder. From head to toe, he was hideous. "You know you love it. Check out the boots." He lifted one foot so she could better see the pattern of the snake skin. She sighed. "I hate western, but if you tell anyone I said so, I’ll deny it." In the apparel design business, there wasn’t a choice; you followed the newest fashions or you could find yourself out in the cold. She herself had recently come up with a few western designs, but only because a couple of clients had specifically requested it. "What I don’t understand is why it’s making a comeback." Amused, Bernie lifted both hands in the air. "Don’t sound so self-righteous. You made an outfit for," he snapped his fingers, "that country music star, what’s his name?" She didn’t name him. Sharing her client list with Bernie would be extremely stupid. "Against my will and against my better judgement, I assure you." "Your husband likes this stuff." Yes, Richard would be happy when he realized the direction fashion, one very small segment of fashion, was headed. Finally, he would fit in again with his denim jeans and snap button shirts. He was so stubborn in his choice of apparel. "I’m working on him." "You’ve had him for what? Fourteen years now? It ain’t gonna happen, Honey. If anything he’s working on you. He’s got you living out in the sticks, doesn’t he?" At the reminder, Melissa’s fists clenched. She was living in the sticks. And Bernie was right. Richard would always go his own way where fashion was concerned. Bernie perched on her desk, and she quickly closed the program she’d just opened. They both smiled. Bernie was an equal, and a competitor; and while she might count him as one of her few friends, they still didn’t trust each other. Bernie began to swing his leg back and forth. "Heard the latest?" She perked up. Bernie could be relied upon to know the current gossip, and it was usually accurate. "Tell me." Bernie leaned forward, enjoying the moment. "Apparently, someone whose name I will not mention, but whose initials are T.K., has finally found a buyer." "No! He’s sold his business?" "No lie!" He laughed, apparently amused by her stunned expression. "Who is it? How much?" "That I don’t know yet." She raised a brow. "Don’t know or won’t say?" Bernie shrugged and plucked the remote off the desk and turned up the volume on the television as the weather report came on. "Just a minute. I’m going out on the town tonight. I want to hear this." He flashed her a grin. "I might need to waterproof my new outfit." Exasperated, Melissa turned to see a weatherman with a cheesy grin and a JCPenney suit filled the screen. "It’s the blue moon tonight, folks! For those of you who aren’t sure what that is, listen close. No, it does not mean the moon will turn blue. What it means is that it’s the second full moon to occur in the same month. It doesn’t happen all that often. On average, about every two or three years. Hence the term once in a blue moon. And lucky us! We’re going to have clear skies tonight in California to see it!" Melissa’s brows furrowed. Why did this ring a bell for her? The weatherman continued. "But warning. Watch out for crazies tonight! Weird things happen on the night of the blue moon! Stay tuned, because later we’ll be interviewing a man who says strange and unusual things happened to him during the last one!" Melissa rolled her eyes. "Please. Some people will do anything to get on television." "Awoooooooowooooowoowooo," Bernie threw back his head and did a very poor imitation of a wolf howling. He ran out of breath and grinned. She shook her head. "Bernie, sometimes you worry me." He laughed. "I thought you liked that science fiction stuff. You told me Star Trek was your favorite show as a kid. Heck, you can quote whole episodes, and you love to design that futuristic crap!" Melissa regretted ever telling Bernie anything about her personal life. She didn’t need him prodding memories best left behind with her drunken mother and their trailer house with the hideous green shag carpet. The door swung open and Xavier walked in. Their boss looked fantastic, as always, clothed in black slacks and a black mock turtleneck. His colored blond hair professionally cut short, he wore a minimum of gold jewelry as well as trendy spectacles. Very understated chic. "Hello, children. Working hard?" Bernie simply shrugged, and Melissa straightened in her chair. Xavier always made her feel she should be doing more, working harder. Xavier smiled. "The work you did at the fashion show on Saturday was brilliant, Melissa. Simply brilliant. You are even mentioned in the Los Angeles Times, so the fashion editor apparently thought so, too. A bit of luck, that, was it?" his tone was cold, his voice soft. They stared at each other. Both knew it wasn’t luck. She’d plotted and planned to get her own name mentioned and he knew it. He lifted the article which she’d already read. "It says here, ‘up and coming Los Angeles designer Melissa Kendal’s creation was the hit of the show. The silk metal alloy gown set off several metal detectors, causing a hilarious moment when security guards jokingly considered having blonde beauty, Miriam Bertram, remove the gown for inspection.’"
Melissa smiled slightly. Everything had gone according to plan. Xavier did not smile. "Now why do you suppose Xavier Ellison, the design house you work for, is not mentioned? Hmmm?" Because she’d made sure she hadn’t mentioned it, that’s why. She wanted her name recognized, not the house she worked for. "How strange." "Yes, that is strange. And if it happens again, I’m going to be very, very unhappy. Understood?" Their gazes locked. Her throat tightened and she fought a swallow. She wasn’t ready to break out on her own yet. "I understand." "Good." He turned away, then back again. "Of course your work wouldn't be nearly so impressive if I hadn't put my personal stamp on it, would it?" Anger formed a tight knot in her chest and heated her cheeks, but she kept her face carefully blank. She loathed him. He’d done nothing, absolutely nothing, but she took her cue. "Of course, Xavier. As always, it was an honor to work with you." Xavier nodded once, accepting his due, then turned to leave. "Of course." Bernie winked at Melissa, slid off the desk and followed. Fuming, she watched them both leave. Why did Xavier always try and take the credit for her work? How much longer did she have to put up with his abuse? She sat forward. There was nothing she could do about it yet. When she was ready to launch her own line, it would be different, she’d be totally in control. She only had to put up with that cretin for a short while longer. When she left, hopefully she’d take Bernie with her. She turned back to her work, reopening the program. There was no such thing as luck in this business. Success took hard work and planning. Fortunately, she was good at both.